GM 3/c Howard B. Landrum, son of W.I. Lamdrum, graduated from Davidson High School; husband of the former Lois Owen. 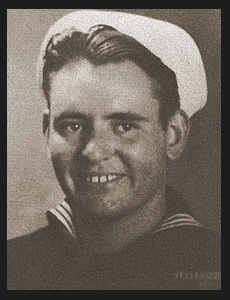 Entered Navy in 1941, trained in San Diego, Cal. ; served in Pearl Harbor, Kiska, the Aleutians, the Solomons, and Guadalcanal; was medically discharded. Awarded ETO Ribbon with five Battle Stars.